The World Series of Poker has announced the dates for next summer’s festival which will run from May 30 to July 17 at the Rio All-Suite Hotel & Casino in Las Vegas. The 48th Edition of the WSOP will concludes with the $10,000 Main Event starting July 8. The something-for-everyone schedule includes bracelet events, satellites, cash games and thrice-daily deep stack tournaments running for 49 consecutive days, with the WSOP Main Event reaching its final nine players on Monday, July 17, 2017. The opening weekend event of the 2017 schedule will once again feature the return of the world’s largest live poker event. Colossus III will be a $565 buy-in re-entry NL tournament featuring two start flights a day for three consecutive days (June 2-4). This event has drawn 43,987 entries during its first two iterations, easily the largest live tournaments ever and allowing all-comers to pony up the $565 entry and try and turn it into $1 million in a matter of days. Also back on the schedule next summer are the Millionaire Maker, Monster Stack, Little One for ONE DROP, Seniors Event and Ladies Championship. The summer poker festival reaches its pinnacle with the globe’s longest-running poker tournament -- the $10,000 buy-in No-Limit Hold’em WSOP Main Event championship -- which is slated to run over ten consecutive days from July 8 – 17 and will feature three start flights (July 8-10). Last summer, the average prize pool in bracelet events was more than $3.2 million with a first prize of over $500k. The 107,833 entries at the 2016 WSOP were the most in the event’s 47-year history with 15,767 entrants making the money. 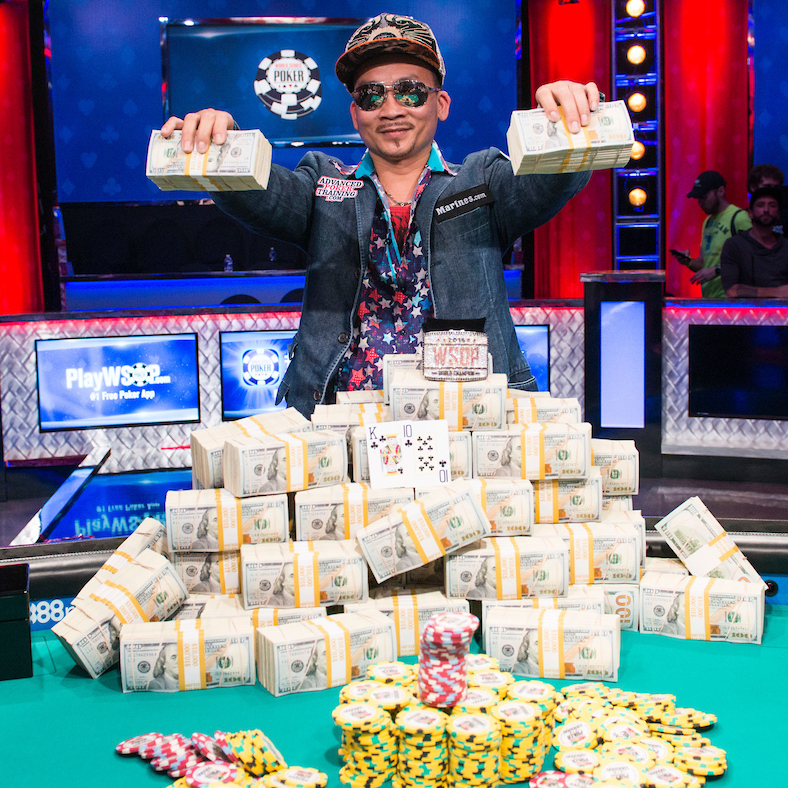 Qui Nguyen won the Main Event for $8,005,310. The event attracted 6,737 entrants, each of whom put up a $10,000 buy-in for a total prize pool of $63,340,268. The top 1,011 cashed.